A $1.3 million payout over the next seven years may be enough to entice anyone to resign. And, if the various media reports are true, that’s exactly what University of Texas head football coach Mack Brown intends to do. However, Bobby Burton of 247Sports.com reported Brown said he was not resigning and was actually in Florida to start recruiting. “If I had decided to step down I sure wouldn’t be killing myself down here. I have not decided to step down,” Brown told Bobby Burton of 247Sports.com. On Tuesday, reports began to surface that Brown would end his 16-year career with the Longhorns by week’s end or after Texas plays in the Alamo Bowl against Oregon. Over his 16 years in Austin, Brown is 158-47 and won the BCS National Championship in 2005 while losing it in 2009. 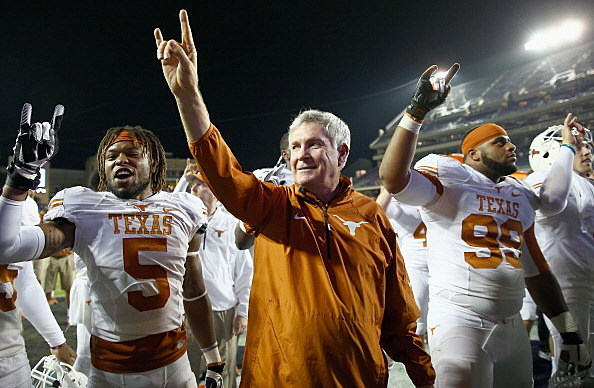 Following the 2009 campaign, the Longhorns have gone a collective 30-20, including a 5-7 season in 2010. The Longhorns are 8-4 this season. Reports on Brown’s possible demise started earlier in the season when stories surfaced regarding a former Texas regent reaching out to Alabama head coach Nick Saban’s agent to discuss the possibility of the Crimson Tide boss coming to Austin. However, last week, Bill Powers, UT president told the Austin American-Statesman that the school was not looking at Saban. Editor’s Note: The Chiefly learned yesterday afternoon from a source at the University of Florida that Mack Brown was spotted on campus playing frisbee with Gators head coach Will Muschamp.